I recently presented a keynote (Leading Teams) for the NJ Learningforward Conference. (Power point available here. ) One topic I explored was supporting teams using elements I had pulled from Patrick Lencioni’s book, The Five Dysfunctions of a Team. I chose to take his dysfunctions and present them as areas of concentration for team builders, leaders, and facilitators. My finding is that few teachers have received any training in the verbal skills of productive conflict. Teachers, who openly handle facilitating conflict among students or with parents, tend to choose avoidance when it comes to colleagues. 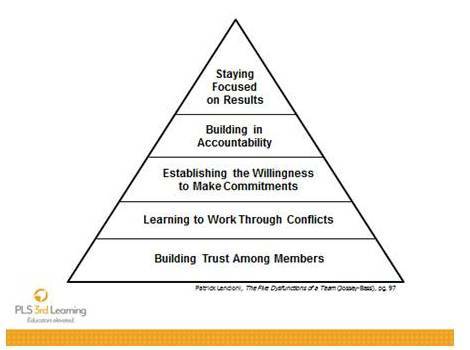 Hence, Lencioni listing avoiding conflict as a source of dysfunction on a team. Armstrong proposes that conflict is an element of learning. So a professional learning community should expect conflict to be present as they explore, learn, decide, and do. I envision conflict similar to resistance that builds muscle in physical development. Without a resistant force to push or pull against the muscle can’t develop. Without resistance to my initial thinking or solution I am unlikely to improve it. Some level of organizational conflict is actually desirable — it’s not always dysfunctional. When conflict exists, it generally indicates commitment to organizational goals, because the players are trying to come up with the best solution. This in turn promotes challenge, heightens individual regard to the issues, and increases effort. This type of conflict is necessary. Without it, an organization will stagnate! Focus on the goal/outcome where there is consensus. The common outcome goal reminds folks that while we may differ in “how” or “what strategy to use” or on the timeline, we have agreement on “why”. If we don’t have consensus on the goal, we need to back up and address purpose that unites the team. Rephrase any participant’s negative phrased comments to positive ones. By phrasing don’t, won’t, and can’t as want to and need to, your facilitation can lead into a solution oriented/consensus direction. As instructional leaders when you hear conflict think facilitation. Conflict measures the strength of an organization. Systems which allow for rich dialogue and depth of collaboration not only allow for differences of opinions, they often encourage it. It is only when one pushes beyond their comfort zone that they grow and change. Conflict often indicates individuals passion to successfully reach a goal in which others path to attainment differs. Systems which allow for conflict are built on a foundation of trust as individuals must feel safe in voicing their differences. If trust does not exist, neither will conflict or growth within the organization. Reading your blogs is like sitting in church on Sunday morning. I always feel like you are talking directly to me. Thank you for know just what I need to hear and read. As an instructional coach and department chair,a I seem to always be facing some type of conflict. Some conflicts I know I have no control over. Other conflicts, I need to be label to guide in a positive direction. I now have some ideas of where to start. I want, more than anything, for my department to be productive and kid centered. Thanks Mr. Barkley. Something for me to ponder over spring break. Thank you for presenting at connections conference 2014. You challenge our way of thinking as teachers. That’s a good thing. I took your advice in checking out your blog. Facilitating Conflict is just what I needed for Student Council. I also created a problem solving flow chart of the steps in solving a problem which is from my own class textbook, School to Work. Again, thank you for your availability and accessability.